Nine years ago, Rob Wallace, a 74-year-old design engineer from Australia and a frustrated flyer, was sure he’d hit upon the ultimate solution to speeding up the slow, tedious process of airplane boarding. The only problem was, he couldn’t find any airline willing to give it a try. “Innate conservatism,” was the only explanation he could summon to explain why not a single carrier wanted to even test an idea that could save them millions of dollars per year. “It’s kind of a chick and egg argument—nobody wants to be first,” Wallace said. But Wallace finally got a chance with the help of Vlad Kolesnik, a researcher at St. Petersburg State University of Civil Aviation in Russia. 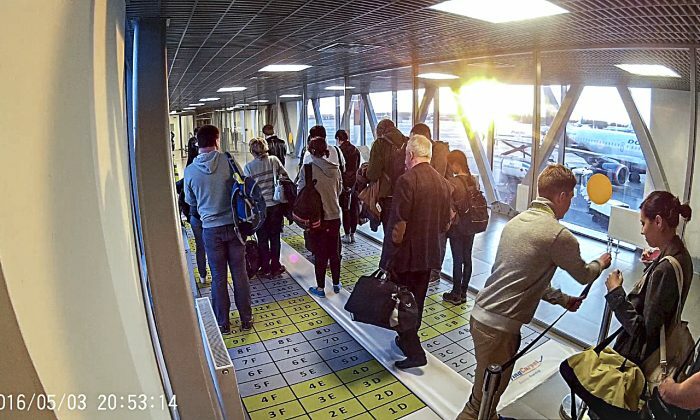 Kolesnik helped organize three tests of Wallace’s “Flying Carpet” boarding system at the Pulkovo Airport in St. Petersburg with Siberian carrier S7 Airlines. The trials weren’t conducted with official approval from the airline’s head office and were tacked on at the end of an already planned series of 62 trials comparing boarding systems over four weeks. But the results, which were just released, show promise. 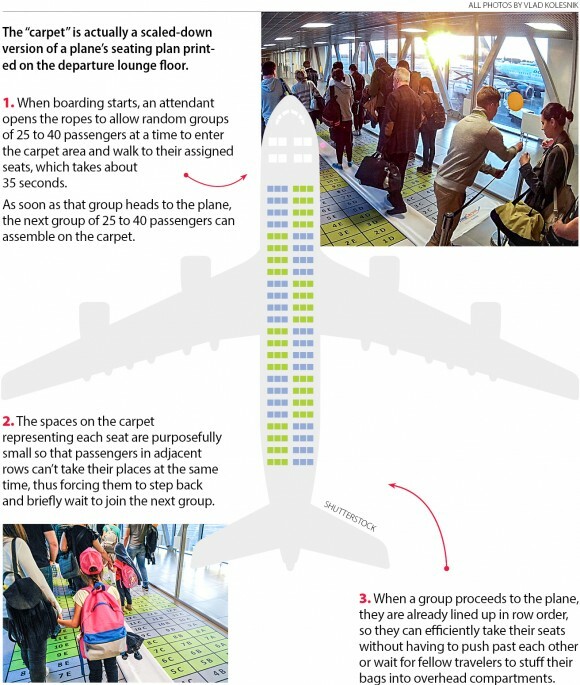 The Flying Carpet proved to be the fastest system; one trial broke the elusive 10-minute barrier while boarding 151 passengers onto an Airbus A320. Kolesnik believes the carpet has the potential do even better than that. “Of course, if the carpet was famous and everyone knew what to do and why we use it, the carpet would show 10 minutes or even less for the 180 passengers,” he was quoted as saying. To compare, in 2013 Spirit Airlines boasted being able to board an A320 in just 20 minutes, which was roughly 10 minutes faster than other major airlines like American or US Airways, according to an article at the time in Forbes. Airlines care enormously about boarding times because every second an aircraft spends at the gate costs dollars. Wallace calculates that saving one minute is worth about $40. While that may not seem like a lot, if an airline can save 5 minutes per flight, and it operates 100 planes, each making six short-haul flights per day, that’s a savings of $36 million over a year. Across the entire industry, that’s about $4 billion annually. The savings matter even more when you consider that boarding times have only been increasing. Research by Boeing shows that it takes twice as long to board a plane today as it did in 1970, going from 18 to 20 passengers per minute back then, to as low as nine passengers per minute now. A variety of factors have contributed to the trend, including two big ones. Checked-baggage fees, which are now commonplace, mean more carry-on luggage—luggage that blocks aisles and takes longer to cram into overhead compartments. Flights are also fuller now. In the 1990s, planes were generally 65 to 70 percent full; today, airlines aim for a load factor of 80 percent or more. With those trends not looking to change on their own, the magic carpet offers a promising solution. Wallace says he’s hoping word of the positive results will attract attention from other airports and airlines. Ideally, he’d like to test the carpet in different countries with different types of passengers to see if the results are the same. He’d like to see whether, with more exposure, proper explanation, and signage, his method can indeed board 180 passengers in under 10 minutes as Kolesnik predicts. Given how frustrating boarding can be, which is what prompted Wallace to dream up his invention in the first place, Wallace sees airlines as the biggest block, not passengers. “I think most of the traveling public would be happy to go along with the system,” he said.